When comparing prices on track skid steer loader and tractor rentals with low ground pressure in San Jose, Salinas and Capmbell, ask about sales tax and environmental fees. Trailer & Tie Down Package Available At Special Rate When Rented With This Loader. Mid-sized compact track loader with low ground pressure, high ground clearance and excellent traction for working on soft, wet or sensitive surfaces. Also offers exceptional performance on firm, stable ground conditions. Eliminate the headaches of challenging terrain with a machine that will get you out of almost any predicament. Track Loaders are turf-friendly, yet highly agile, outperforming most skid loaders in adverse conditions. And with no tires to go flat. Please Note: This Tractor was designed for low ground pressure applications and working in areas with tight access Not Slopes. Do Not operate this tractor on more than a 15 degree slope it will Rollover. Never operate this loader on a side slope. Capacity, 35% Tipping Load 1,330 lbs. 50% Tipping Load 1,900 lbs. Track width 15 in Maximum Dump Height 91"
Capacity 1,400 lbs. 50% Tipping Load 2,000lbs. Track width 11.8 in Maximum Dump Height 109"
To safely tow this tractor, A Tool Shed requires a 3/4 ton full sized vehicle or larger. You must have a 2" receiver type hitch that is attached to the frame of the vehicle, in good condition, and rated at 10,000 lbs. or more. Rental rates include either a tooth or smooth bucket. The Equipment Protection Plan does not cover damage to the tracks. 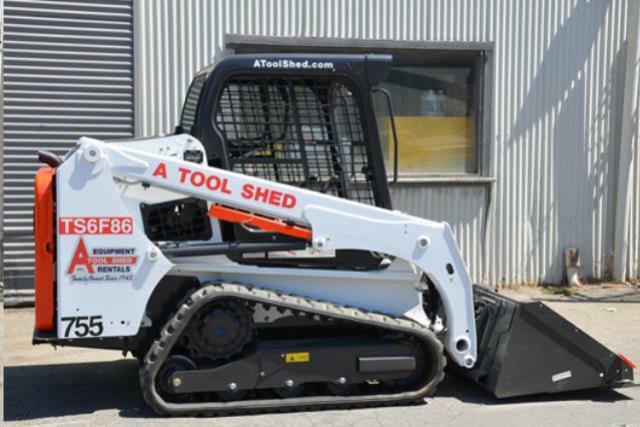 * Please call us for any questions on our 62 inch /66 inch track skid steer loader tractor rentals in San Jose, Campbell, Salinas, Santa Cruz, Watsonville, Morgan Hill, Hollister, Santa Clara, Gilroy, Milpitas Sunnyvale, Fremont, Salinas, the Greater Bay Area and the Monterey Peninsula.